Murder by Gaslight: The Hawkins Matricide. Islip was a quiet little town on the southern shore of Long Island, populated by the families of seafaring men and summer visitors from New York, escaping the noise and bustle of the city. The town had no saloons and had did not have enough crime to justify building a jail. 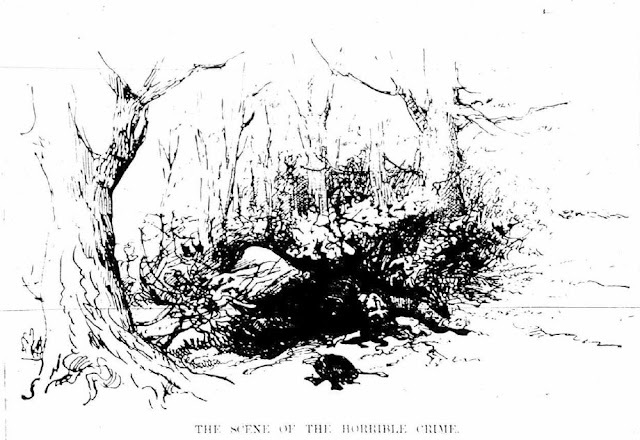 So the discovery, in October 1887, of woman’s body, shot and beaten, off the Brentwood road in the woods just outside of Islip, threw the town into a state of high excitement. The body might have been missed completely, but it was wrapped in a bright red shawl. The wagon driver who spotted it got down to take a look and found a middle-aged woman, shot three times in the head, her face bruised and disfigured beyond recognition. From her clothing, she was identified as Mrs. Cynthiana Hawkins, widow of Captain Fredrick Hawkins, who had made a fortune as a sea captain and later in the lumber business. Her maiden name was Clock, one of the most prominent families in Long Island society. Her brothers immediately initiated an investigation of her murder. Robbery was ruled out as a motive; she had not been assaulted, it looked more like a revenge killing. One name came to everyone’s mind, F. Asbury Hawkins, Cynthiana’s twenty-two-year-old son. Asbury was at odds with his mother, having declared his intention to “break loose from his mother’s apron strings.” He had begun leading a life of dissipation, drinking heavily, and carousing with servant girls and his mother strongly disapproved. Mrs. Hawkins was devoted to her children, and had no problems providing her son with money, but expected some deference to her wishes. Asbury had become infatuated with an attractive German girl named Hattie Schrecht, and they had decided to marry and had even set a date. Mrs. Hawkins strongly objected. Asbury’s uncles believed that he had murdered his mother, and the coroner’s jury agreed. The people of Islip, now with a target for their anger, threatened to lynch him,but the sheriff and his men able to prevent this. Without a town jail, Asbury was held under heavy guard at Brown’s Restaurant and spent the night in custody at the home of Constable Egbert Benjamin in Bayshore. Everyone was sure of Asbury’s guilt, but how his mother’s body had ended up by the side of the Brentwood Road was still a mystery. Under questioning Asbury explained. On Saturday, October 29, he rented a buggy and took his mother for a ride, telling her that her sister was ill and near death. As they drove, Mrs. Hawkins upbraided him for wishing to marry a servant girl, harshly insulting Hattie Schrecht. When he could take no more, Asbury pulled out his pistol and shot her in the head. In a fit of rage, he beat her and shot her twice more before dumping his mother’s body by the side of the road. He returned the buggy around midnight and told the owner not to clean it as he would be renting it again the next day. On Sunday, he rented it again and cleaned it himself, trying to remove the bloodstains. He only partially succeeded. Asbury Hawkins’s trial was swift by New York standards; the whole thing took sixty hours, with nearly two-thirds of the time taken up by jury selection. There was no question that Hawkins killed his mother, at issue was whether it was done with premeditation and whether he was in his right mind when he killed her. His attorney’s closing argument lasted two and a half hours but did not sway the jury. They found him guilty of first-degree murder, and Asbury Hawkins was sentenced to hang. On December 11, 1888, Asbury Hawkins said his last goodbyes to his relatives and to his sweetheart, Hattie Schrecht. The next day he was hanged in the jail yard of the Suffolk County Court House, before a crowd of 100 invited witnesses. Dozens more stood outside. After his burial, Hattie Schrecht wept by Asbury’s grave, blaming herself for his death. I doubt it was premeditated. I feel sorry for all three of them. Murder of a School Mate by Two Girls.